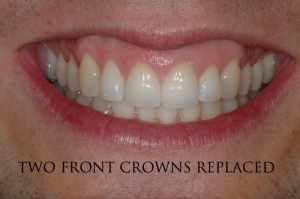 When clients come to see us for a consult, one of their biggest concerns is the dark line around their existing porcelain crowns. They are also concerned that, if they do more porcelain crowns and veneers, eventually they will see the same dark, ugly line around them. This is something that should not happen, or even be anticipated, when considering any type of cosmetic dentistry that involves porcelain crowns or veneers. Traditionally, porcelain crowns are made with a silver-colored metal base. 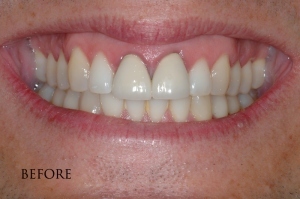 The base is used because, when cemented to the tooth, it gives strength to the porcelain and helps prevent fractures. Unfortunately, as it reaches the gumline, the porcelain gets thinner and thinner; eventually, the metal will reflect through. The crown may look good initially. But as the gum recedes throughout the years it exposes the thinner section of the porcelain, and the dark lines appear again after years of use. At times these traditional crowns with a metal base have cheaper, non-precious metals, such as tin. These metals can eventually leach out and tattoo the gum edges -- and, once again, a dark line will appear. Worse yet, most people develop or are allergic to these metals and the gums get inflamed and bluish in appearance at the edges. If the porcelain crowns do not completely fit the tooth or seal it well, staining will eventually accumulate at the tooth's edges. This is not just a dark-line-issue at this point; it can eventually damage the the underlying tooth by allowing bacteria and plaque to start the process of decay. At NYC Smile Design, we take every precaution to avoid these situations completely. First, we never use metal-based crowns. The more contemporary porcelains are extremely durable and are bonded to the teeth, rather than cemented. This gives strength to the porcelain and also avoids the possibility of fractures. When it comes to bonding porcelain crowns or veneers, we are extremely meticulous and fastidious in creating a glasslike finish against the tooth. This both minimizes staining at the tooth edges and prevents any leakage underneath them.